7.07 Very easy - next time possibly halve chicken breasts to make cooking a little easier. 8.13 I completely overcooked but the kids enjoyed. 8.07 Really quick and easy - double caper mixture for 4. Found some leftover ricotta cheese in the fridge and some peas in the freezer and this recipe turned up during my EYB search. What a positive surprise! A tangy, sweet & creamy sauce plus very quick to make. Will repeat! Delicious! And really does come together in no time. Will use less sugar (half?) next time if the strawberries still are that sweet. 4.08 Really yum. Could try w beef, lamb, chicken. Good with butter fish. Really tasty. 2.15 Scrummy - kids loved. Burnt parsnip ribbons & raw chicken. Terrible. 6.11 Divine - sauce beautiful & easy. Serv. A fantastic easy weeknight meal in itself, or little dinner party entrees. It's tasty and good for vegos. Grate in the zest of the lemon to give extra tang. 6.11 I really liked - H not so keen. 1.08 Delish - really nice with the addition of raspberries - I only used milk choc but would be better still with dark choc. 4.08 Cut back on salt. 9.09 Yum & easy - Dressing would also be great on other salads. 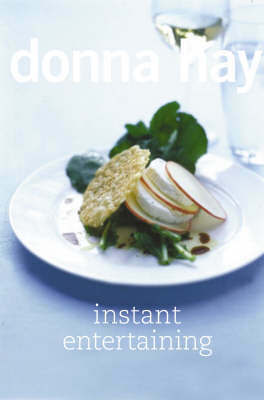 Following the worldwide success of her last book, 'The Instant Cook', Donna Hay brings a new collection of fresh and easy-to-follow recipes and clever styling ideas for entertaining family and friends. 'One of my favourite things is sitting around the dinner table with family and friends, watching people enjoying great food, wine and conversation. But we all lead busy lives and sometimes the thought of cooking for twelve, six or even two can be a little daunting. So that's why I've put together this collection of simple but special recipes that will make your lunch, dinner party or barbecue a memorable occasion for all the right reasons!and guarantee you lots of return invitations.' From impromptu dinners to more lavish celebrations, 'Instant Entertaining' is packed full of inspiring meal ideas. Each chapter contains simple recipes for every occasion, as well as styling ideas for your table and home, all beautifully photographed in the style for which Donna Hay has become known worldwide.